Jack (Mikey) Michael Bowles, Jr. 37 of Narrows, VA, went to be with the Lord on Tuesday, February 5, 2019 at his home. Mikey was born on March 5, 1981 in Blacksburg and was a son of the Dorothy L. Thorne of Rich Creek and the Late Jack Michael Bowles, Sr. Besides his father, he was preceded in death by his grandmother, Evelyn Smith Bowles and two fathers-in-law, Glenn Patrick Bowles and Johnny R. Meredith, Jr. Mikey was a 1999 graduate of the Narrows High School Greenwave, he enjoyed music mostly making up his own rhymes and songs, he enjoyed playing the drums and football in high school and playing drums and the guitar in the First United Methodist Church in Narrows. He loved raising his pit bulls, Mufasa, Mecca, Montana, Simba and their puppies. 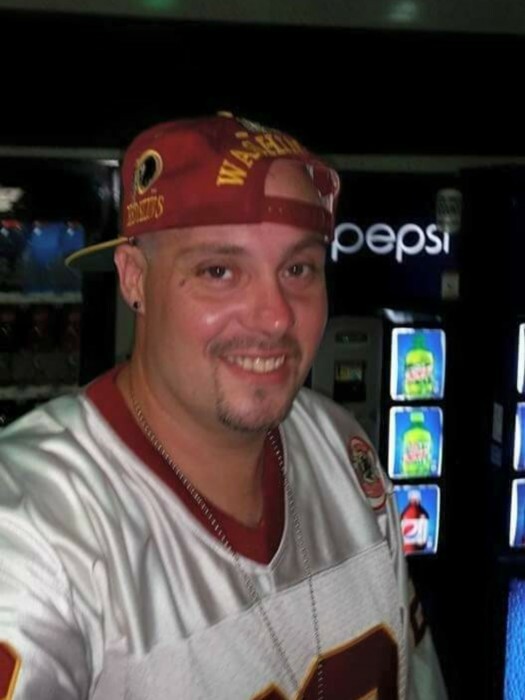 He enjoyed swimming, playing Xbox One with friends and motorcycles and a bigtime Redskins fan. He is survived by his wife Pamela C. Bowles of Narrows, his mother Dorothy L. Thorne and her fiancée, Punky Meadows, two daughters, Autumn Elaine Mae Bowles of Pembroke, Sierra Cherie Walker, two sons, Tyler James Walker and Carson Allen Walker all of Bozoo, WV, mother-in-law, Robin “Mom” Meredith of Narrows, paternal grandfather, Jack Harner Bowles of Narrows, maternal grandparents, James and Dorothy Meadows of Narrows, one sister, Jessica E. Bowles (Jason Link) and their children, Jaylyn Bowles, Jazmyn Link, two brothers, Nicholas Bowles of Narrows, Michael Bishop of Blacksburg and his children, Cheyenne and Crystal Bishop, one aunt, Melinda Bowles Tabor of Narrows, brother-in-law, Philip Bowles and wife Angela and their three kids, Heaven, Aaliyah and Anton all of Narrows, special cousins, Cristin Lindsey Lawson of Rich Creek, Rena Lindsey Fields of Lebanon and many other nieces, nephews and cousins who loved him, two special friends, Megan Boyce and son Brayden of Rich Creek, Xbox friend Tra Soto A celebration of life will be held Saturday, February 9, 2018 at 2pm at the Riffe – Givens Funeral Home in Narrows. The family will receive friends one hour before the service from 1 – 2 pm. The family is being served by Riffe - Givens Funeral Service in Narrows, (540) 726-2442, and online at riffefuneralservice.com.